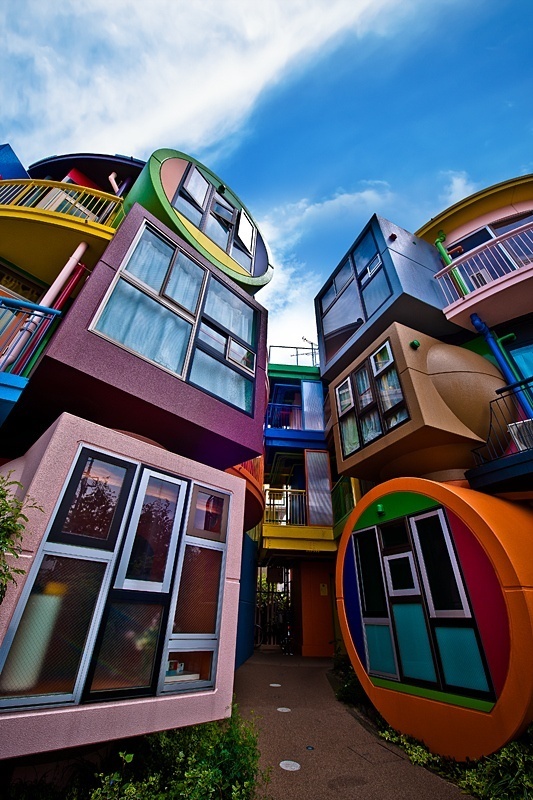 The Reversible Destiny Lofts – Mitaka (In Memory of Helen Keller) is a nine-unit multiple dwelling. It was first completed example of procedural architecture put to residential use. These lofts reflexively articulate the residents’ operative tendencies and coordinating skills essential to and determinative of human thought and behavior; which means to say, the lofts manage, by virtue of how they are constructed, to reveal to their residents the ins and outs of what makes a person, in this case the resident. This is the same set of tendencies and skills to which Arakawa and Madeline Gins gave diagrammatic form in their decades-long research project The Mechanism of Meaning. Built by Takenaka Corp., a leading Japanese contractor, the apartments actually meet every building-code requirement. Through its construction, the Reversible Destiny Lofts – Mitaka (In Memory of Helen Keller) invite optimistic and constructive action to help residents live long and ample lives.